If you’re one the millions of adults who experiences headache pain each year, and you take medications to get relief, you may be masking your symptoms instead of treating the root cause of your discomfort. Surprisingly, many women and men are misdiagnosed with tension headaches when the real, underlying cause of their pain comes from problems with the temporomandibular joints (TMJ) in your jaw. At My Ashburn Dentist in Ashburn, Virginia, we can help alleviate your headache pain by diagnosing and treating the hidden cause, so you get relief from the chronic symptoms of TMJ syndrome. With up to 90% of American adults suffering from tension headaches at some point in their lives, and 37 million experiencing debilitating migraines, it’s a health condition that motivates researchers to uncover the cause of all these headaches. A study by the University at Buffalo’s School of Dental Medicine in New York found a connection between tension headaches and temporomandibular joint disorder (TMJD). It turned out that the research team could replicate tension headache symptoms in 82% of the men and women participating in the study. How did they do this? Surprisingly, by performing a clinical exam of the muscles responsible for pain caused by TMJD. Lead researcher Richard Ohrbach, DDS, PhD, noted that many medical professionals fail to consider the connection between TMJ symptoms and headaches. Instead, these symptoms commonly lead to a simple headache diagnosis, and therefore, never address a jaw disorder. If you’re one of the millions of Americans taking over-the-counter pain medications to relieve recurring tension or migraine headache pain, you could be overlooking the underlying cause, and therefore, you’ll never get the best possible relief for your symptoms. Fortunately, TMJD is highly treatable, so if you can pinpoint your symptoms, it may help you realize if your pain is TMJ-related. Do you hear or feel a clicking or grinding sound when you move your jaw? Do you have tenderness and pain in your face? Do you suffer from earaches? Do you have a stiffness in your jaw that makes it difficult to fully open your mouth? Do you clench your jaw or grind your teeth? Do you have sinus pain or pressure? Do you have neck pain? If you answer “yes” to any of these questions, and you frequently get headaches, you could be missing the obvious culprit. 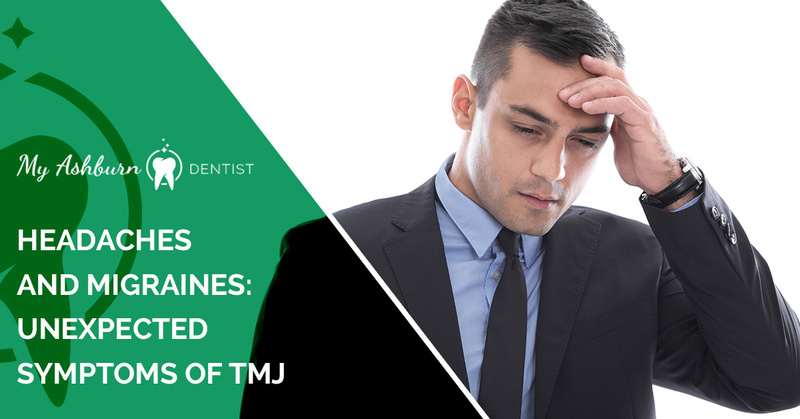 When it comes to finding long-term pain relief from headaches and the other unpleasant symptoms associated with TMJD, visiting your dentist could be the solution you have yet to consider. Our expert team at My Ashburn Dentist has successfully treated numerous cases of chronic headaches for our dental patients, and we may be able to help you, too. If you continue to suffer from headaches, or any of the symptoms of TMJD, we can uncover the underlying cause of your pain, so you can finally get relief. We want to help you get rid of your chronic tension and migraine headaches for good. As dentists, we’re highly skilled at diagnosing and treating TMJD, so you don’t have to suffer from headaches any longer. We take a caring, compassionate, approach to all your dental concerns. To schedule a comprehensive dental exam that includes your jaw and your TMJs, call My Ashburn Dentist or make an appointment for a consultation using our online booking system.